From New Times and Ethiopia News, Sep 5th 1936 - "1500 bathers cheer the Emperor". 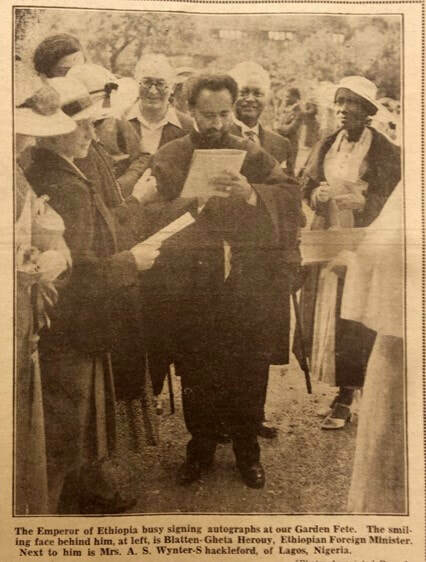 A report on Haile Selassie I visiting the Egyptian delegation at Hampton Court on a Sunday and taking a visit to the nearby Molesey Lock swimming pool in the Thames. "He was recognized immediately, and the 1500 bathers gave 'three cheers for the Emperor' and cried 'Hail, Selassie!' which has become the popular retort to fascist slogans." John Hilton from the New Statesman describes being at the address of Haile Selassie I to the League of Nations in Geneva in June 1936: “Yesterday I listened to the speech of the Negus. I have never heard or seen anything quite so impressive as his manner of delivering it. He did not move a finger or a muscle of his face. It was that kind of ultimate self-control and self-restraint that comes of great suffering nobly borne. I had an odd feeling that he was unreal; as if he belonged to a dream world, as if he were a sort of shadow. He seemed to radiate a spiritual quality in the light of which that congregation of go-getters didn’t quite know where they were or what they ought to do. When the Italian journalists yelled at him he stood there quite still, quite unmoved, very king-like. The way he left the assembly after having listened to the interpretation of his speech was so full of ancient dignity and inner strength and repose, that for two pins I could believe souls are in transit and his has been journeying for ages and ages. I had the feeling, and I’ve still got it, that his very presence there before the assembly was an Event, and one that in some queer way will tell." From the Devon and Exeter Gazette , 12th June 1936: "Nobody who attended the Abyssinian reception at the Princes Gate Legation could fail to be impressed by the quiet dignity and regal fortitude of Haile Selassie. Even in the most difficult circumstances, he displays just those qualities we like to regard as part of the public school tradition. Even his very gracious smile, emphasised by fine teeth against an Ethiopian bronze, could not banish the careworn look on his remarkably “Biblical” features." Memories of Haile Selassie I in Bath (1936-1940) by residents of the city. Haile Selassie I, family and government resided in Bath during the Italian occupation of Ethiopia. The clips below are taken from Dr Shawn Napthali Sobers' documentary, Footsteps of the Emperor (1999).